The iServer Business and IT Transformation Suite provides enterprises with interchangeable Solutions to manage, govern and visualize Enterprise Transformation. iServer offers a number of features to help implement and manage GRC ititiatives, from supporting the analysis of risk to the implementation of compliance measures. The objectives of this foundation course in IT service management are to enable you to understand the importance of service management, both to the IT service provider, and to its customers. Students will also be introduced to the service lifecycle, its processes, and the functions which carry out those processes. Specifically, it shows how the ITIL best practice framework can be used to improve the quality, effectiveness and efficiency of service management in every type of organization. Our course has been accredited by EXIN, who are licensed by AXELOS as an Examination Institute for IT Service Management. Why study ITIL Foundation with Good e-Learning? 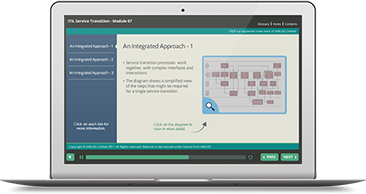 The course gives an overview of the ITIL Framework which is captured in the 5 core ITIL volumes of Service Strategy, Service Design, Service Transition, Service Operation and Continual Service Improvement (2011 versions). Instant 6 months access - start today! The ITIL Foundation Certificate has become the IT industry's de-facto introductory professional qualification in the field of IT Service Management. Gaining your ITIL Foundation Level certification will enable you to progress your development in IT Service Management, and is a pre-requisite for the next level of ITIL qualifications; ITIL Intermediate, MALC and Expert. * Our course has been accredited by EXIN, who are licensed by AXELOS as an Examination Institute for the ITIL® Foundation Certificate in IT Service Management. Our courses are easy-to-use. Students will benefit from an interactive multimedia environment that enhances the way you study ITIL. With e-learning, individuals and organizations avoid the typical costs of travel and consultancy by studying independently online. ITIL® Foundation - What is ITIL? ITIL can be adopted by an organization and adapted to meet its specific needs. By completing this ITIL Foundation course, you will gain an understanding of the importance of service management, both to the IT service provider, and to its customers. Specifically, you will understand how the ITIL best practice framework can be used to improve the quality, effectiveness and efficiency of service management in every type of organization. Our course has been accredited by EXIN, who are licensed by AXELOS as an Examination Institute for IT Service Management. Why adopt ITIL for your organization? The main reason for its continued adoption is that it is based on a practical approach to service management, utilizing what actually works in real organizations. The guiding principle behind this is to ensure that all efforts are engaged in a common goal, to deliver IT services that support the requirements of the business, by delivering value to the organization. ITIL will enable you to utilize and implement IT service and capabilities to provide and maximize value within your organization. Adopting the method and service within ITIL will increase productivity, optimize costs and improve customer experience.